Have you ever wondered what it took to make your vision come to life? In this personal project, in the last four weeks of my senior year, I captured 365 portraits of my high school class and brought together an entire community through the portraits. After attending G-Star School of the Arts, a charter film high-school in West Palm Beach, Florida for four years, the realization hit me. Throughout my four years of high school, I've walked past hundreds of students, from freshman to seniors. I realized I had never once interacted with them. I didn't know their names, where they come from, or what their story is. In the last four weeks of my senior year, I came up with an idea that would be my way of giving back to my school community for all they've given me through my four years there. I wanted to get to know the students, the faculty, and the staff and discover what made them so unique. Every day for an hour at lunch, I sat down with students, friends, faculty, and staff with whom I’ve never talked with and got to know them a little better. I would setup my white background, tripod and camera, and shoot. Rain or shine. Whether it was one person who showed up or 30, I would photograph them with heart. 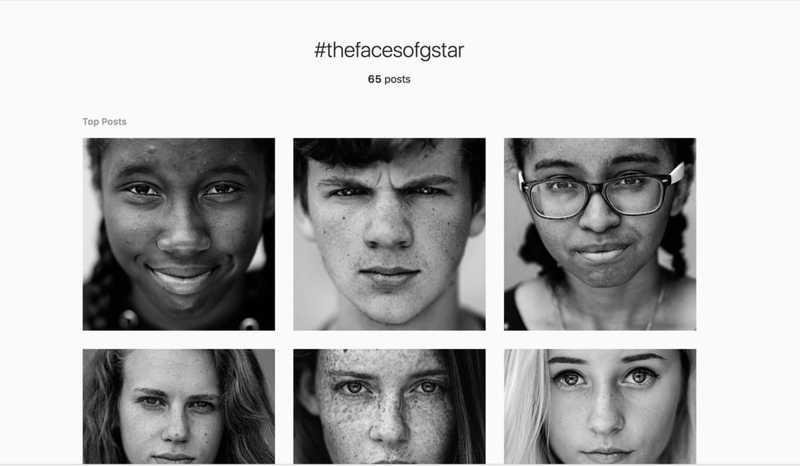 I called the project "The Faces of G-Star." The goal for this project was to showcase each individuals diversity and beauty but also show what an entire community can do together where every person matters. The project started out as a photo of some of my closest friends Shane and Matt. Both people have impacted my life and inspired me to carry out my dreams and peruse a career in the arts. They were there for me every step of the way. One day after class I asked each friend if I could sit with them for an hour and discuss our futures, and our favorite memories from highs-school. We laughed, smiled, and got emotional reminiscing over the last four years and seeing how far we've all come since freshman year. The camera was used as a tool to dig deeper and just have a conversation. After the first two portraits, I gained up the confidence to approach my other classmates and teachers with whom I've bonded with over the years. This got the idea rolling. After I edited the final shots, I posted them to Instagram and my website under the hashtag #thefaceofgstar and after each one I posted, the idea got stronger. After uploading a few with that hashtag, I asked my friends to share their picture using #thefacesofgstar so that their friends could see it. The project started off small. I continued to photograph the people I knew, but after uploading theirs, their friends saw the pictures and wanted to be apart of the project. 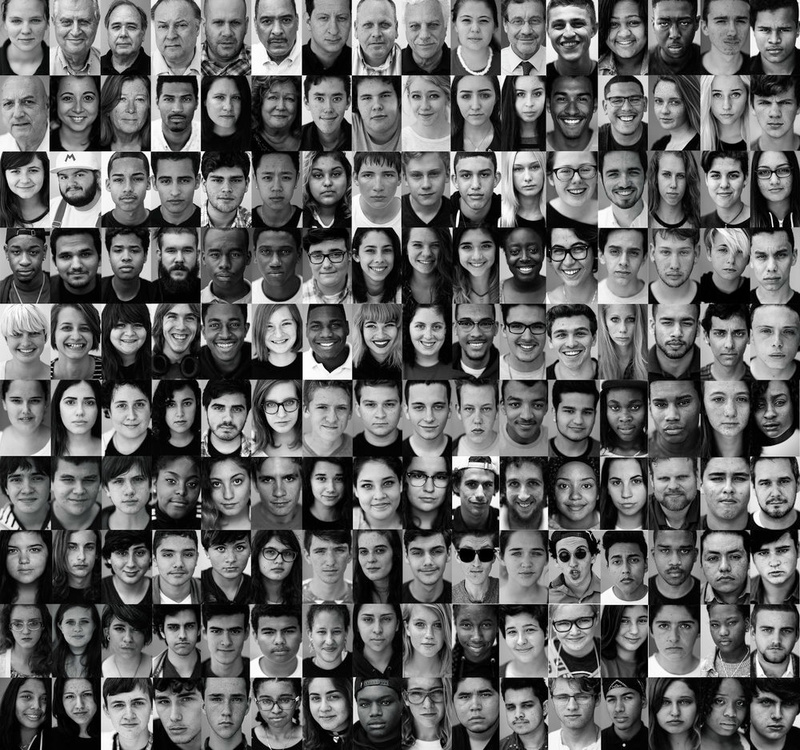 I set out to capture 365 portraits in four weeks. The goal seemed unfathomable and unattainable. However, after reaching the first 80 portraits in the first week, I knew it was something I had to continue. No matter what. That's when the project took off. Every day I would post on my instagram telling people to come get their headshot, and the next day wherever I was in school, dozens of people would find me. They came because they saw their friends being apart of the project and they also wanted to partake. These were all people I've never met. On average, each day I would shoot 20 portraits and upload them all to my website. 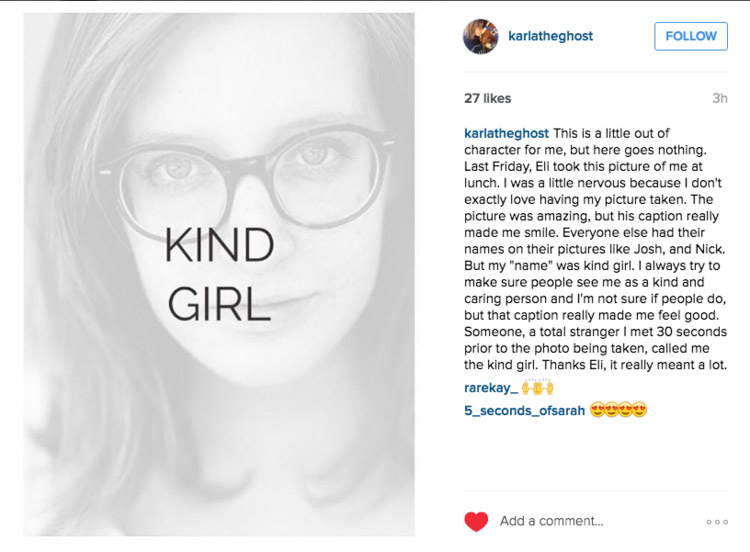 I titled them with what I first thought when I met that person: "Kind Girl," "Keep Smiling," "Beautiful." The project before I knew it, had reached my end goal of 365 portraits in four weeks. I stopped at 365 to emphasize that a full year would not be complete without just one day. The same was true for the schools community. Without each individual doing their part, the school could not function. When I sat down with each subject, generally I gave myself 30 seconds to a minute to make the subject feel comfortable in front of the camera. Ultimately I told them, "I want you to own whatever look you're giving me. Give me a smile, or serious face with 100 percent confidence." I was aiming to empower each kid, regardless of the color of their skin, if they were wearing glasses or had braces, fat or skinny, that each person who stepped in front of the camera was beautiful. When the subjects first stepped in front of the camera, they were nervous. So I developed a five-step process that makes a subject comfortable in front of the camera in under a minute. 1) Take a big deep breath. Let it all out! 2) Drop the shoulders down. Release the tension. 3) Look like a turtle in 3-2-1 (Extend your neck)! 4) Close your eyes and think about the expression or story you're going to show. 5) Open your eyes when your ready. When they opened their eyes at the last second, I would shoot the portrait. Miraculously the subject was not thinking about the camera, they were thinking about their expression. In the end of the one-minute session, I took one photo. When they arrived, I would ask them to bring their friends and the friends would stand behind me being the main entertainment. Making them laugh or encouraging them to just be them selves. Their friends new them better than I did. It was humbling to see people who were insecure, or were shy but the second I took 30 seconds out of my day to get to know them a little, they opened up and walked away on top of cloud nine. 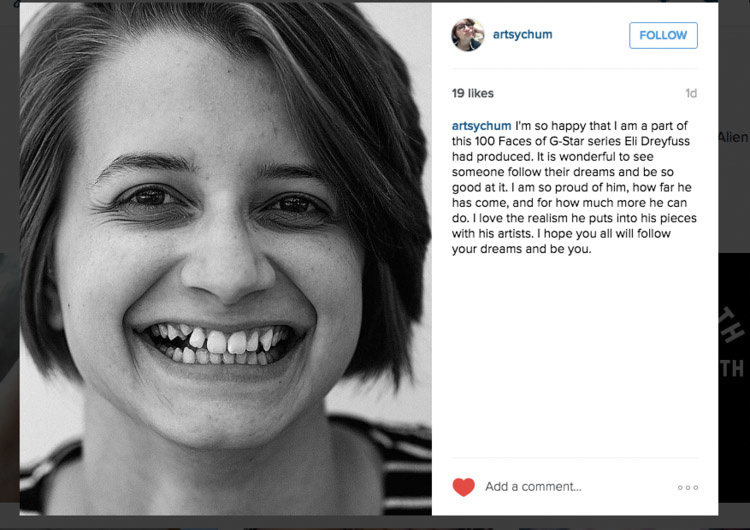 I was able to witness first hand how a portrait could change someones life. When I took the first photo in the project I had no idea who I would have the privilege of meeting or how it would affect me as a person. I started the project as a way to re-connect with people and allow others to meet new people through my photographs. After the project, I would walk down the halls and people would know my name and I would know theirs. I was humbled to witness how portraits can bring together an entire community of people and spread awareness to being the best person you could be. I learned to treat everyone as human beings and not simply judge them by their appearances. When I started the project, I knew I wanted to make a direct difference in my school. As the project was coming to a close and I was graduating, I approached the founder of my high-school with whom I came close with during the duration of the project. I introduced him to the idea of displaying the photos in the hallway of the school, and he loved it. 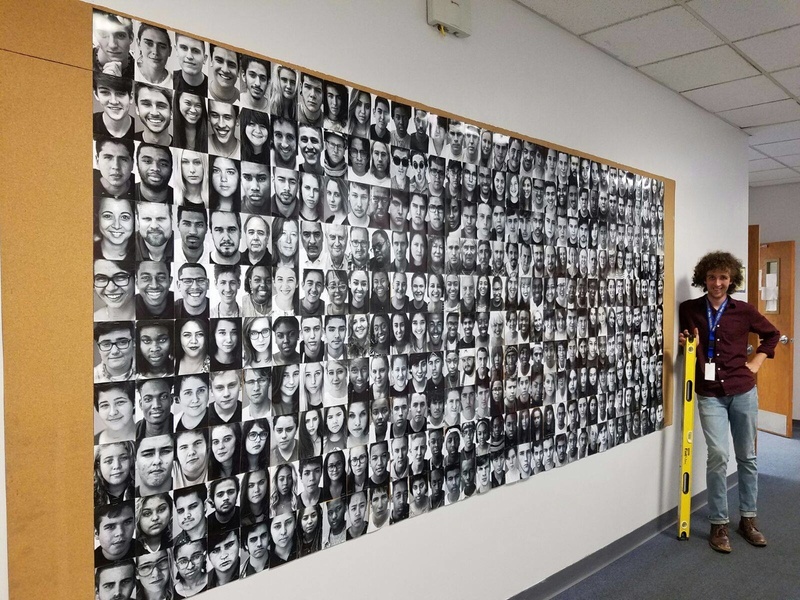 He graciously sponsored the vision by providing the funds and space to print out all 365 portraits and display them in the school's main hallway. 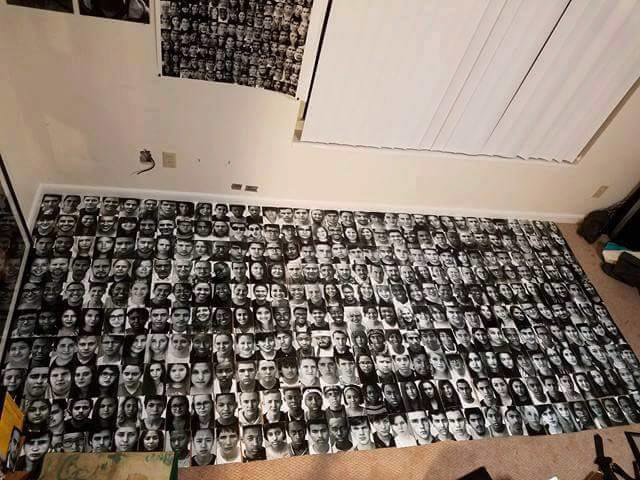 The next day I went to my local print shop, printed out all 365 pictures, and on my bedroom floor began arranging every photo individually and pairing it with other pictures similar in composition or expression. I laid out the entire exhibition on my bedroom floor and then titled and numbered each row of images and packed them into separate plastic bags. For example Row 1, image 1. The next day I drove up to school, with a staple gun, a leveler, some sheets of cork board and 365 5x7 inch portraits in hand. When I got there, I started out by drawing 10 rows of straight lines across the cork board. I laid out 35 images across and 10 images down. The final display was 15 by 8 feet. The process took a grueling 10 hours straight. I could barely walk the next day. Thankfully I had some help along the way by classmates and teachers but by the end, I was the last one in the building. When I hung up the pictures, I placed the senior class (my class) on the top three rows, then followed by the teachers then by the underclassmen. 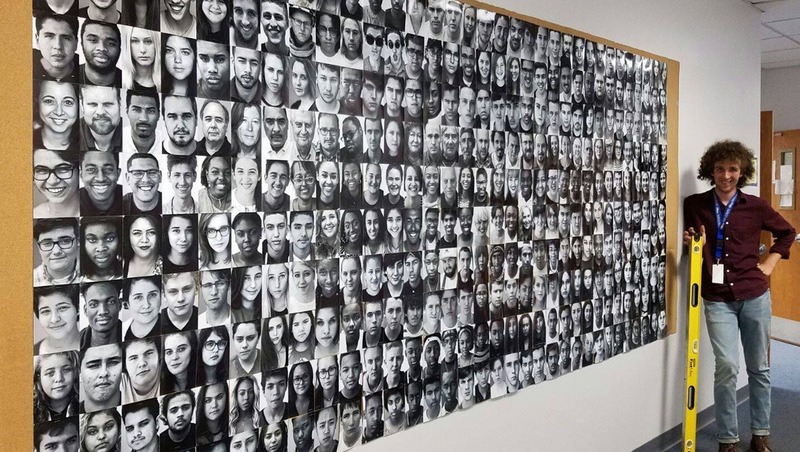 The goal was that the students would take down their pictures and keep them as a gift. I wanted the incoming class to be able to meet the students from the previous classes. Even if a student or faculty member left, their legacy would stay. After four months of preparation and over 100-plus hours of work, the exhibition was officially installed! 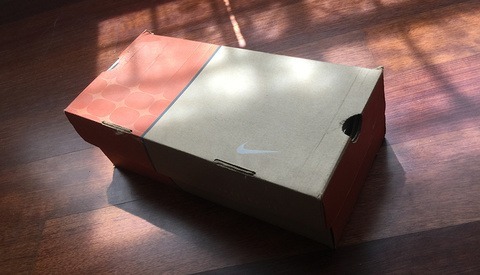 Standing there, looking at it, I got emotional. The feeling was indescribable. From concept to print, its was my vision coming to life in front of my eyes. For four weeks, rain or shine, one person or thirty show up, I still setup my camera. I did not miss a day. I learned through this journey and project to never give up on your dreams, no matter how crazy or far away they seem. Anything is possible if you put your mind to it. 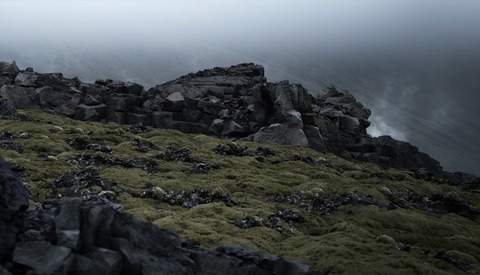 How Much of a Threat is CGI to Photographers? What an awesome story and accomplishment Eli Dreyfuss! Congrats on pulling it off. wow thank you man! Thanks for the comment! Really amazing project, Eli! I teach photography and post-production at a private school in West Palm, and my students have been inspired by your work in Scholastic. I look forward to sharing this endeavor with them next class! wow!! Thats incredible! What school? I went to G-Star School of the Arts. I was also just a judge this year for scholastic! I would love to maybe come in and talk to the students? Cool concept and nice execution. I really like your 5 step process to elicit the defining expression in one shot. Keep up the great work! Thanks man!! I'm actually hoping to continue it in the coming years as a way of continuing to give back to my community. Glad you got something out of it. Thats actually my next article for Fstoppers! How to connect with strangers in 30 seconds or less :) Stay tuned! Wow! You did an amazing job, congratulations on that! I believe that you can accomplish even more if you use speech writing service at https://essaybison.com/speech-writing-service/ as your help. It will be really useful if you will continue to work with high school and colleges. It will help you to understand how kids think nowadays.